Discussion in 'Online Casino Promotions' started by Marina, Oct 15, 2015. Whether or not you believe in ghosts, Omni Slots is giving you the chance to check close up whether they truly exist. This leading online casino is inviting players to try their luck in a new promotion, and put themselves in line to win one of the hottest prizes up for grabs in the industry. where many guest swear that that they’ve come face to face with the supernatural. The Telegraph publication recently ran a piece in their travel section, describing the ghostly encounters at Hotel Burchianti. “Guests staying in the Fresco Room have reported the sensation of icy breath on their face and seeing a man with an unearthly pink glow. Other sightings include a child that skips down the hotel’s corridors, a long dead maid who cleans in the middle of the night, and a woman who sits knitting in a chair”. If this sounds like a visit that is just up your alley or you simply wish to visit this stunning area in Italy, then head on down to Omni Slots today and see how you can get your hands on this prize. For every cumulative deposit of €25 that you make into your real money OmniSlots account between October 15th and October 31st 2015, you will earn one lottery ticket into the lucky draw. 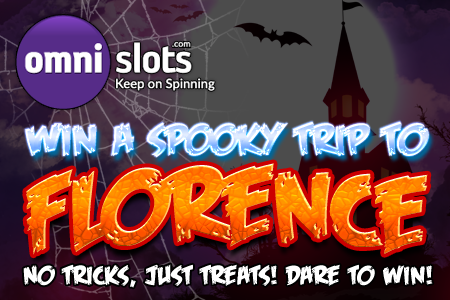 Omni Slots said that on November 3rd 2015, the prize draw will take place and one lucky player will be told about winning a trip to Florence. Two return flight tickets to Italy. and offers them more than just the run-of-the-mill rewards. Endorphina and Microgaming. If you prefer playing table games like BlackJack or Roulette you will find different versions of these games in the table games lobby at OmniSlots. Players who want to take part in the fun at Omni Slots and be in on the action this Halloween and beyond, should visit the site today and open up an account. This entitles them to claim OmniSlot’s generous welcome bonus - €100 free on their first deposit in the form of a 100% bonus + 50 free spins offer. OmniSlots also offers reload bonuses, weekly offers, highroller specials and alternative deposit method bonuses. Happy haunting this Halloween at OmniSlots!